The prompt over at dVerse Poets Pub yesterday was to write a poem inspired by the art of Danny Gregory. I wrote one yesterday based on a sketch of dogs here. Then this morning getting ready for work I had an idea for another one. This entry was posted in Poetry and tagged Christ, Christian, Christianity, Danny Gregory, dVerse Poets Pub, Faith, God, Jesus, Life, Love, Poem, Poems, Poetry, Religion, Service. Bookmark the permalink. I loved that ending! Thank and God bless you! Cool poem to go with the sketch, Linda. I’ve seen him too! Linda, I think this is my favorite of all the poems I have read of yours. I agree that God doesn’t spend much time hanging around in his condos. He is out with the people like his Son was & as we should be as well. Excellent write! I like this, Linda! I too believe, and hope, that condo is dusty. I like what you expressed in each of the stanza. 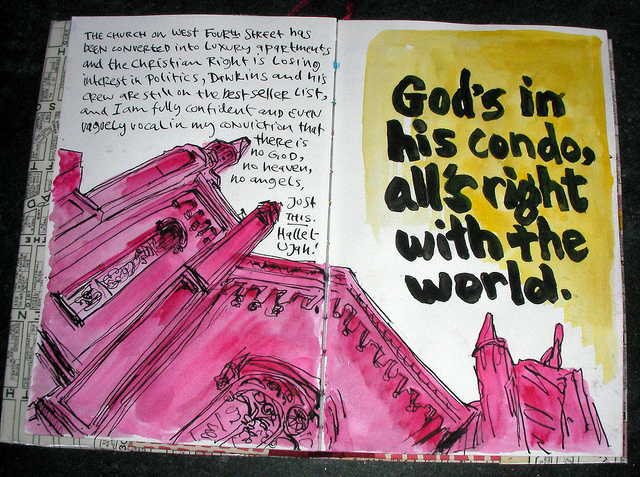 Oh I hope so .. as many other write, that god has to be everywhere, and the churches are for humans.